The X-47B flew its first flight in "cruise" configuration (landing gear up) on Sept 30, marking an important milestone in its flight test program. A robotic warplane that can take off and land from U.S. Navy carriers by itself won't do much good if it runs out of fuel in midair. That's why the Navy recently completed flight tests to see how well the unmanned military drone could belly up to a flying fuel tanker. Such early tests used a Learjet to play the role of Northrop Grumman's X-47B drone designed for the Navy — but the piloted Learjet tried out the vision and navigation systems of the X-47B. The Learjet pilot even turned over control of the aircraft to the X-47B's guidance software during the flight tests that completed on Jan. 21 in St. Augustine, Fla.
"These flights demonstrated empirically that an unmanned system can conduct aerial refueling operations with accuracy and precision," said Pablo Gonzalez, program manager for Northrop Grumman's Unmanned Combat Air System Carrier Demonstration (UCAS-D) program. "The aircraft never gets tired, and it responds exactly the same way to operator commands every time." The Learjet started out flying one mile from the aerial tanker — a K707 aircraft similar in size to the Air Force's KC-135. The Learjet pilot then turned over control to the X-47B's flight software, so that an operator aboard the flying fuel tanker or on the ground could command the Learjet to fly different maneuvers used in aerial refueling. A next step for the midair refueling tests might involve hooking up the X-47B drone (or another surrogate aircraft) to the flying fuel tanker. The availability of two X-47B unmanned aircraft enables the UCAS-D program to conduct a faster and more productive flight test program. 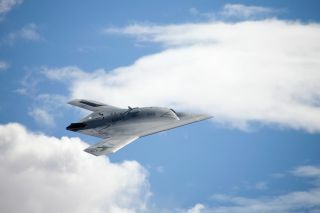 "These tests are a critical step toward proving that the X-47B can perform autonomous aerial refueling using either the Navy's probe-and-drogue refueling technique or the U.S. Air Force's boom/receptacle approach," said Carl Johnson, vice president and program manager for Northrop Grumman's Aerospace Systems sector. "Future unmanned systems will need to use both refueling techniques if they plan to conduct longer range surveillance or strike missions from the carrier." The Navy and Northrop Grumman plan to test the X-47B drone during takeoff and landing situations on the heaving deck of a real Navy aircraft carrier in 2013, as well as fully autonomous aerial refueling in 2014. If all goes well, the U.S. military could soon add even more robotic warplanes to fight alongside its "Top Gun" human pilots. InnovationNewsDaily on Twitter @News_Innovation, or on Facebook.